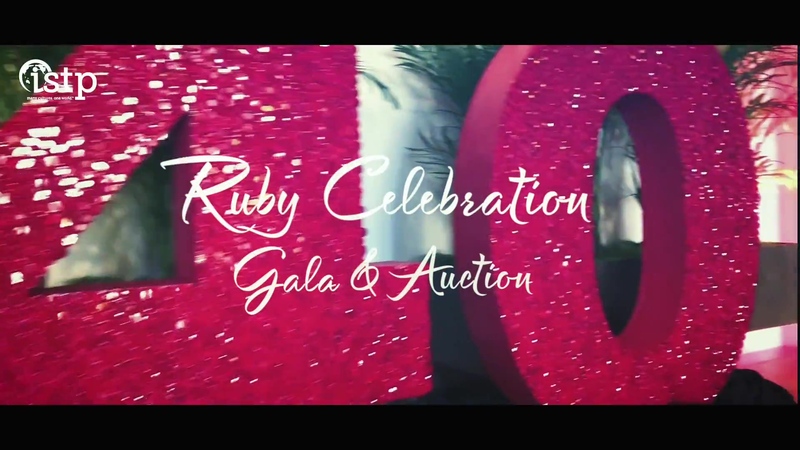 The Ruby Celebration Gala & Auction was the perfect way to celebrate ISTP turning 40, as we honored our beloved school's past, present, and future. 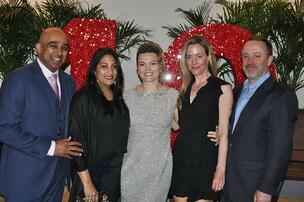 Guests enjoyed a brand new venue – Menlo Park's Hotel Nia – which set an elegant tone for the evening, along with the magnificent sparkling ruby red "4-0" that greeted guests as they walked in. Our parents, faculty/staff, alumni, and grandparents dressed to match in tones of ruby red and elegant black. After a fun cocktail hour catching up with friends and community, guests moved into the ballroom, where ISTP's official parent band, "Band Camp," gave a rocking performance of hits from Queen, Journey, and more. It's always fun to discover the many hidden talents of the ISTP parent community! After the performance, our program began with a look to our past, as we honored a very special guest in attendance – ISTP's founder Charlotte de Géry. 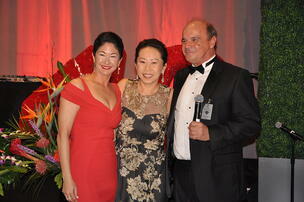 We began the fundraising portion of the evening by awarding the Golden Paddle. In an unprecedented turn of events, both the Golden Paddle and the second prize Club Med vacation were won by the same lucky person – Jesscy Wu! The live auction was lively as always, and one special lot stood out – the final chance to experience the culinary wizardry of our multi-talented Head of School, Philippe Dietz. The lot sold for $19,000, and was generously tripled, raising nearly $60,000 for the school with a single lot. We took a break in the bidding to look to the future of our school with this year's Fund-a-Need. The funds raised this year will be put towards expanding learning possibilities for students across all grades, by building an outdoor classroom and adding parcours gymnastics equipment on Cowper, and by introducing virtual reality and digital art technologies into the classrooms on Cohn. We are so grateful to the community, who pledged $120,000 towards our dreams to further enhance our students' learning experiences. By the end of the night, with the money raised for the Fund-a-Need and live auction, our community was able to raise over $290,000 for the school. Thank you to everyone who attended, volunteered, and donated. A huge thank you to our amazing Gala Chairs, Shirley Chou and Courtney Brooks – without you this magical evening and important fundraiser would not have been possible!